On Monday, Feb. 4, the Houlton Rotary Club met for its luncheon meeting at Watson Hall. HOULTON, Maine — On Monday, Feb. 4, the Houlton Rotary Club met for its luncheon meeting at Watson Hall. Two new members were inducted by Rotarian Leigh Cummings and the new members are Ted Sussman and Katie Sloat and a seven day reading was done for Chris Nickerson. 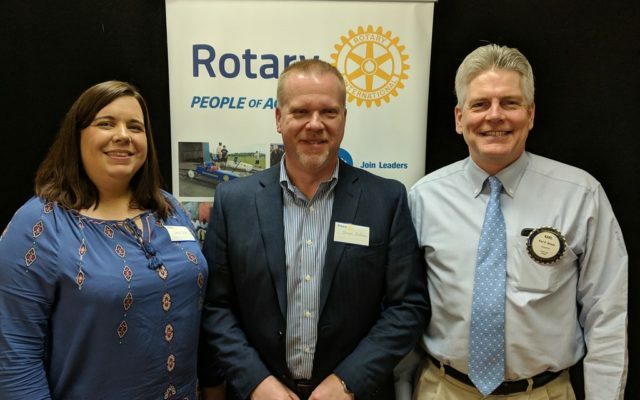 Rotarian Karl Woods introduced his guest speakers Sean Anderson and Sarah Parnell. Anderson is the director of operations at Houlton Regional Hospital involving human resources and physician practices. He has served at Cary Medical Center and The Aroostook Medical Center. Anderson is a lifelong resident of Caribou and is currently a member of the Caribou Rotary Club. Anderson introduced Parnell whose organization hopes to be in one of the hospital’s buildings on Hartford Street. Parnell is the regional manager for “Groups, recover together” and she lives in Topsham. Houlton is slated to become the most recent location for Groups. Other locations include Portland, Lewiston, Farmington, Machias, Augusta, Rockford, Biddeford and Calais. The focus is treating people struggling with opiate addiction by providing low barrier affordable treatment. Group therapy is required an hour a week and a seven day prescription of suboxone will be available. Members must return for therapy each week and the treatment can last generally 18 to 24 months depending on the individual. The goal is to be substance free and able to function in society with gainful employment. No medicine is on site and is to be obtained at a pharmacy. The center intends to be good neighbors and Parnell is meeting with residents that live nearby. Groups accepts members with or without insurance. Unfortunately, uninsured members have a six month retention rate of 40 percent with only a 33 percent success rate. Members with insurance have a 70 percent retention rate with a better success rate. Going to the source of the opioid epidemic Parnell mentioned the responsibility of pharmaceutical companies who claimed there would be no addiction to these drugs. Suboxone is a replacement drug to assist members develop new habits and skills and as Parnell explained should not be abused or used to get high as that would defeat the purpose of the treatment. The weekly group therapy of one hour as required is the key to success as this addiction can rarely be fought alone. The website for Groups is joingroups.com and a phone number for scheduling a consultation is 1-800-683-8313.